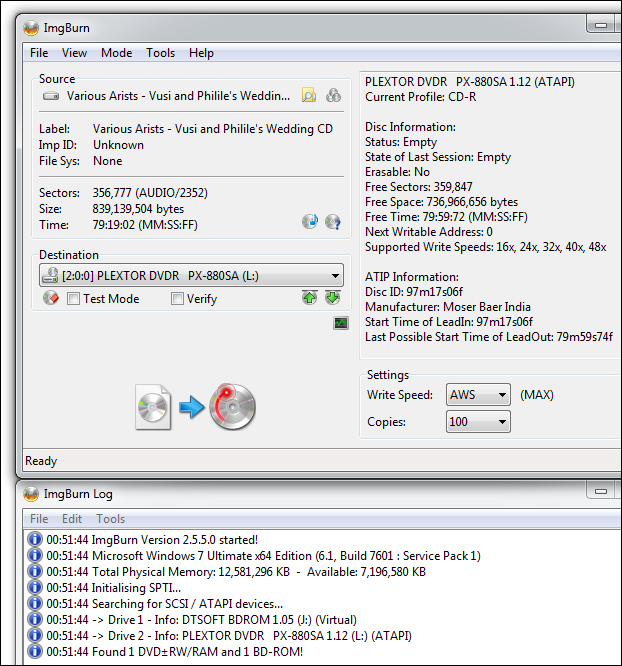 CD-Text is an extension of the Red Book Compact Disc specifications standard for audio CDs. It allows for storage of additional information (e.g. 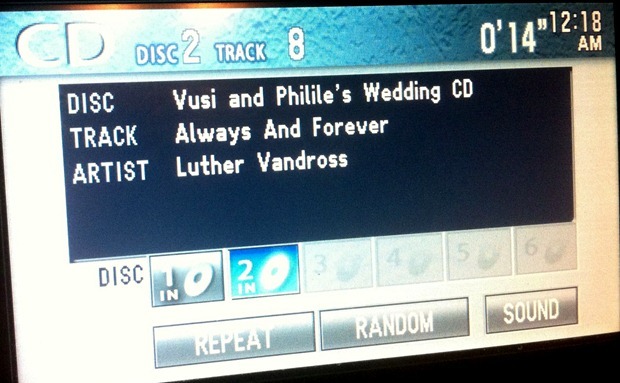 album name, song name, and artist) on a standards-compliant audio CD. Phrased differently, you'll be able to see the track details on your car CD player! This has been out for 14 years and I can count on one hand the number of times I've actually SEEN a CD in my car have text associated with it. This evening I was putting together a Mix CD for my brother-in-law's upcoming wedding. I put together a lovely compilation from a list of songs they gave me, and even managed to fit in 79 minutes and 48 seconds. This is extra awesome because a CD holds 80 minutes. I bought the MP3s legally, and then burned them. When I went into the car to test the CD, I saw only DISC ---, TRACK ---, ARTIST ---. I said to my self, "Self, this is weak sauce." I put all this work into the CD but I get hyphens instead of love? So I started doing some research and trying different tools. I found ImgBurn (download link) to be the burner that gave me the most control while still maintaining an easy interface. Start up ImgBurn, and from the Tools Menu select, "Create CUE File." What's a CUE file? It's a track that specifies exactly how to lay out the tracks on a CD before you burn them. The CUE includes not only the MP3s you want to burn, but also the gaps between songs, song length, the song text, etc. You can make them in Notepad if you are really showoff Linux User who just has to do everything in Vim someone who likes to do things manually. Here's an example snippet of my CUE file, just so you know what one looks like. 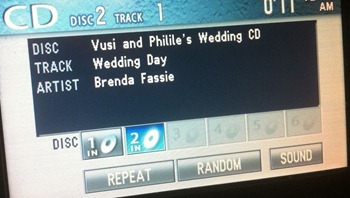 TITLE "Vusi and Philile's Wedding CD"
ImgBurn has a nice CUE File Creator/Editor. 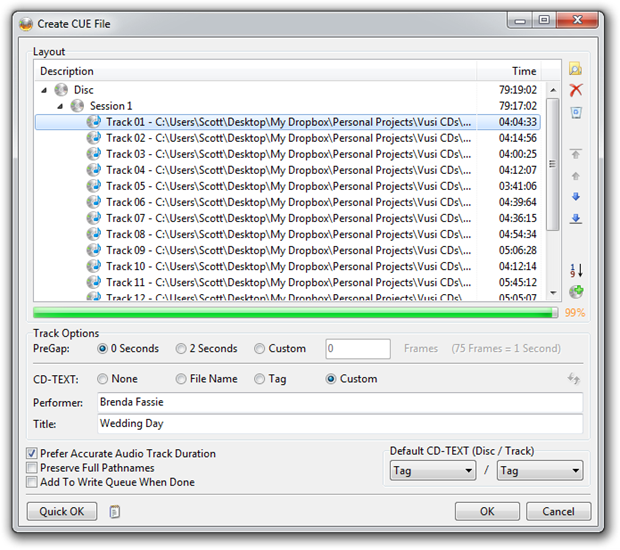 Tip: Be sure to set the "Default CD-Text" for the disc and the track to pull from the MP3s ID3 Tags. This is just the default. You can change this for each song later. Click each song and, if need be, change the CD-TEXT to Custom and put in whatever you like. Perhaps rather than song titles, put in messages to your sweetie? When you click OK, you can save your .cue file for later use. Later, in Write Mode in ImgBurn, click the Folder button up there by "Source" and select your .cue file. All your MP3s will automatically be loaded up and queued for write. Now, when I burn my CD, I see this on my car's dashboard, which gives me GREAT satisfaction, as it should you, Dear Reader. Doesn't this just make you want to burn some CDs with CD-Text and go see where they work? It did me. Enjoy. NOTE: iTunes includes some CD-Text support, but it doesn't always work. Apparently there are two ways to burn CD-Text and iTunes doesn't seem to do the more compatible one. I like a little more control and that's why I prefer ImgBurn. Hmm...I thought all cars had MP3 support or AUX input to use with a phone....but maybe not...it was years since I last burned a normal audio CD. Us, maybe, but not everyone. Certainly not my wife, or 90% of my non-techie friends. I distinctly remember Nero Burning ROM to include the feature to write the CD-Text for you. Nero burning rom has pretty great CD-Text support and has for about 8 years. It will automatically populate song titles / artist from MP3 ID3 tags and if the ID3 has correct track order (in the case of an album) it will sort them correctly. All you need to do is enable CD-TEXT when you create the compilation and put in a Title. And like Scott, I still have an old (but good!) CD player in my car. I make copies of my bought CDs so if they get stolen or melted then I'm not too fussed. AND I get to put CD-Text on them as I have not yet discovered a commercial CD that comes with it. I love the fact that at 12:18AM you went out to your car to test and took a photo. That's dedication. Been using ImgBurn for years, but never used it for this. Good stuff. Media Monkey - http://www.mediamonkey.com/, has pretty good support for CD-Text as well as excellent MP3 tagging support. Roberto - there are still those of us that prefer the sound of a CD over a lossy MP3. Admittedly a car is not the ideal situation to hear the differences as it has the acoustic properties of a tin can, so I normally revert to my phone+mp3, but there is a difference that can be heard! One of the first things I do when I buy a new CD is create a "backup" using a program which will populate the CD-TEXT. Why studio's don't include this on their CD's as standard is beyond me. Hanselman to the rescue again! I need to remember to search your site 1st. You rock man.